Built by Flickr’s Manuel Nascimento this gorgeous Model Team Ford Model A rat rod is surely one of the most beautiful Lego creations of 2018. Packed with incredible detailing, Manuel’s Ford features opening doors, brilliant brick-built wheels, and Power Functions remotely controlled drive, steering and adjustable suspension. The Power Functions don’t stop there though, as a separate motor turns very possibly the finest V8 engine this site has ever featured. With incredible attention to detail Manuel’s V8 not only turns with a timing a chain, it features real oscillating valves. It’s a thing of beauty to watch in action and you can do just that via the video at the end of this post. There’s much more of this spellbinding Ford Model A rat rod to see on Flickr, where there are fifteen stunning images available to view in Manuel’s album. Click on the link above to head to Flickr for the full gallery. Pastel green is normally a colour reserved for beach huts and handbags, but gosh can it look good on a car! The car in question is a ’31 Ford Model A hot rod, inspired by a real vehicle built by custom-car legend Larry ‘Voodoo’ Grobe. Redfern1950s is the builder behind this brilliant Model Team version, and you can see more of both it and the real hot rod that inspired it by clicking here. Whatever is going on there’s more to see at Pixel’s photostream via the link above, where there are some lovely details to be found including the use of spears and daggers as metalwork plus a beautifully simple yet instantly recognisable postbox. Ford’s Model T is undoubtedly the most remarkable car in history. The world’s first mass-produced car, constructed using the world’s first production line*, built in at least 12 countries, and with production spanning eighteen years, the Model T was at one point more popular than all the other cars on sale worldwide put together. With a 50% global market share, Henry Ford had a quite a daunting task to replace it, so – to use a phrase of the time (probably) – he dilly-dallied for ages, allowing competitors to catch-up and erode his company’s position. Finally, at the end of 1927, the Model T’s replacement was ready. The new Model A was a huge jump over the old T, with twice the power, a 50% higher top speed, and – more importantly – conventional driver controls. The Model A went on sale in December 1927, and just over a year later a million had been sold. 6 months after that the figure passed two million, and by the time production ceased in 1932 almost 5 million Model As had been produced across nine different body styles. This version is one of the most common, the ‘Tudor’ sedan, recreated wonderfully in mini-figure scale by TLCB favourite _Tiler. Unusually, _Tiler hasn’t hod-rodded his Model A, leaving it instead as Henry Ford intended. A staple of the hod rodding scene, due its popularity and readily available parts supply, the Model A probably exists in greater numbers today as a hot rod than it does in its production form. However there’s something very cool about seeing an original un-modded A, and you can check out more of _Tyler’s, along with his collection of hot rods, via the link above. Another day, another Elf returns to TLCB Towers in the hope of a meal token. A token said Elf was duly granted, because this Ford Model-A ‘five window’ hot rod is right up our alley. Featuring a wealth of Technic functionality Jonathan Elliott‘s hot rod is definitely worthy of the Technic category, but to be honest we’re not really looking at the working functions because the outside is Just. So. Damn. Cool. There’s only one image available at present, but nevertheless you can still check it out at Jonathan’s Flickr photostream by clicking the link in the text above. *That’s in your internet history now. Heh heh heh. This lovely Ford Model-A V8-engined hot rod comes from OutBricks of Flickr aka Kevin Heitke of MOCpages, and if you like his creation as much as we do then you can build your own, as he’s made a video tutorial of the instructions! You can check out all the images and find a link to the aforementioned build steps via the links above. 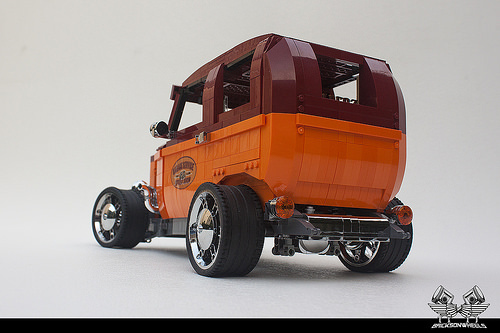 Office favourite and regular bloggee _Tiler has returned with another beautifully photographed hot rod, this time loosely based on the official LEGO 75875 Ford Model A set, only with much, much more detail. Check out the full size image at _Tiler’s photostream via the link above. This year’s Creations for Charity event continues apace. It’s a great opportunity to help do some good via the hobby of Lego building (like reading this blog). It’s also a great opportunity to buy some brilliant models, designed by some of the top Lego builders from around the world. One example is this Ford Model-A pick-up hot rod from TLCB regular Tim Henderson, one of two vehicles he has donated to year’s fundraiser. Click the links in the text to view them and buy them. The Showtime television show ‘The Tudors’ seemed to mostly consist of breasts interspersed with historical inaccuracies, but seeing as we quite like the former of these we’ll let it slide. It didn’t feature any hot rods though, and we have no idea how the English royal family that came to power following the War of the Roses gave its name to modified early 1930s Fords, but sometimes the car world needs a good mystery. Is it as simple as it has two doors (Tu-dor)? Anyway, whatever the logic, this Model Team Ford Tudor hot rod looks the business. BricksonWheels (co-author of The Art of Lego Scale Modeling reviewed here yesterday) is the builder, and there’s more to see at his photostream via the link above. We’re trying to get through this post without making a nice ride / rod / your mom reference, but as we’re failing hard we’ll just jump straight to the link; You can see more of Tim Henderson’s Ford Model A ‘Mitzy’s Hot Rod’ at his Flickr photostream here. These two tasty looking classics were discovered by one of our Elves on Flickr. Paul Kim is the builder, returning for his second appearance here at TLCB, and he’s constructed this ’50s Ford F100 pickup and matching Model A hot rod beautifully. You can see more of both models via the link above. MOCpages’ B. Rick (which we’d love to be his real name!) makes his TLCB debut* with a beautiful little Ford Model A hot rod. See more of his classic V8 roadster at the link. *We think. B. Rick’s name isn’t conducive to an accurate search through our archives as our search engine returns almost every post we’ve ever published. Apologies Mr. Rick! This Ford Model A flatbed, or ‘ute’ for our Australian readers, is the work of Aussie builder Parrington Levens. Mr. Levens has utilised* some very old parts for his very old truck, and they look rather nice in this context. You can see more of this beautiful ute on MOCpages. It’s time for another trip into the online Lego community, as we resurrect the oft-forgotten ‘Group of the Month’ segment here at TLCB! We’ve featured a number of creations from the Head Turnerz group here at TLCB, and both of today’s finds hail from one of the group’s monthly ‘meets’. Their February meet is all about hot rods & customs, from ’32 Ford Hi-boys all the way to slammed ’49 Mercurys, as demonstrated by Thomas Graafland‘s stunning rat rod above and Aaden H‘s slick ’30 Ford Model-A below. You can see all of the group’s creations and join in the fun by visiting the Head Turnerz Flickr page here. We’ve featured _Tiler‘s awesome BMW-powered Ford Model-A hot rod here at The Lego Car Blog before, and he’s recently released a few new salt-flat photographs that are too good to pass up. 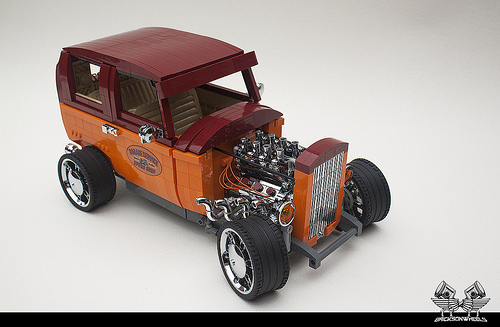 Based on a real 1928 Model-A Ford built by hot rod builder Mike Burroughs, _Tiler’s Lego version is one of the star mini-figure scale models of 2013. See all the new photographs on Flickr at the link above.